It's already been seven weeks since we started this party!! Can't believe it. SO loving your sweet and gorgeous turquoise projects. Keep 'em coming!! And I'm hoping some of you have taken my challenge and made some fall turquoise stuff. Can't wait to see it! I am just loving the features this week. Wait till you see them! are welcome to come and decorate and sew for me anytime!! Now it's time to link up your turquoise beauties! Be sure to grab a button and share this party with others! PLEASE! Thought of you when I painted 150 acorns turquoise this week :o) That post won't be up until tomorrow so I linked up to some of my other turquoise inspired fall decor :o) Thanks for hosting! Thanks for the invite to join your party, Sara. 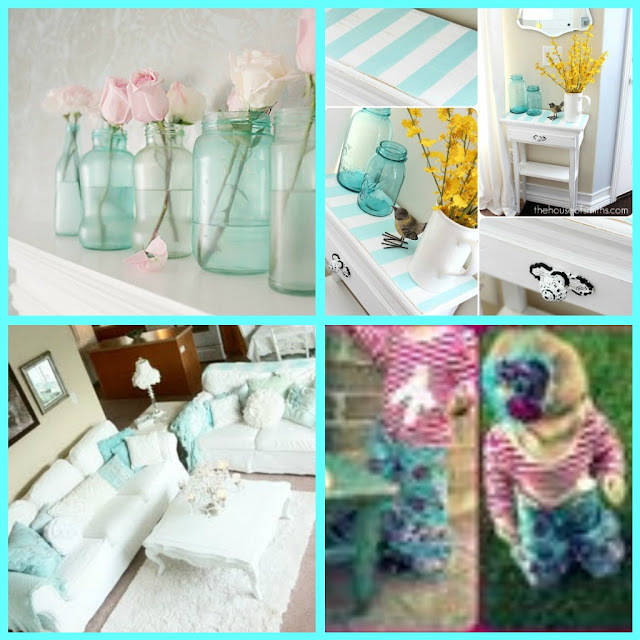 I definitely love Turquoise and have used it in my home for years now. Great party! Thanks for stopping by my blog & inviting me to over! Thanks so much for hosting! And thanks again for the invite to link up Sara!!! Thanks so much for the invite to your darling party! I love your site and your pictures are great! If you don't mind me asking, are you taking a course online? Hi! Thanks for the invite to join the party! I linked up my Duct Tape Purses but the photo doesn't seem to be showing up. thanks for visiting on creative juice! i am following your blog now! & linking up my bug party tutorial! Thanks for hosting and thanks for the invite! I'm loving all this turquoise! Hi, Sara! Thanks so much for the invitation to join your turquoise party! All this turquoise inspiration! So happy to join in the fun! Thanks for the invite. I've linked up Jack's Quilt. Love the other projects, what a fun theme for a link party! What a fun theme for a party :). Well it looks like I missed the party, but thanks so much for the invite! I'm your newest follower so I won't miss the next one!